Today’s update on personal income and spending deserves a closer-than-usual inspection. The devil, along with the government’s stimulus program, is in the details. First the good news, such as it is: disposable personal income rose a strong 1.1% in April, the Bureau of Economic Analysis reports. That’s a gain worthy of an economic expansion of the strongest order. What, then, is it doing here, in the middle of the deepest recession since the 1930s? The government, to cut to the chase, has learned a thing or two about Keynesian economics since FDR was delivering fireside chats. But while Washington now excels in handing out checks to the masses in a timely manner, it hasn’t yet figured out how to get Joe Sixpack to spend the state’s stimulus payments. Could a mandatory spending bill be the solution? Or perhaps the government could transfer the payments directly to the retailers and cut out the middleman, i.e., the consumer. In fact, there’s already some of that in play as we speak. Large corporations that should have disappeared continue to operate, albeit on the kindness of government handouts. In an effort to juice consumer spending, which remains the workhorse of the economy, the government’s sending money to taxpayers far and wide. But as our chart below shows, the consumer is wary of spending these days. 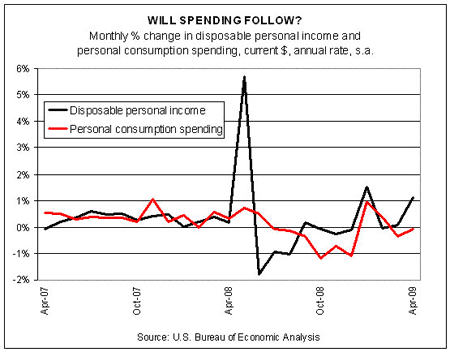 Disposable personal income rose sharply in April, but personal consumption expenditures slipped by 0.1%. Other than the spending increases in January and February, Joe Sixpack’s consumption habits have receded in every month since July 2008. In search of some perspective, it’s worth noting that disposable personal income rose 1.1% in April, but wages and salaries were unchanged for the month. How did the economy manage that trick? The government’s various spending efforts helped bridged the gap. But so far, consumers seem intent on banking any income and/or reducing the considerable debt burden that weighs on American households. The knee-jerk reaction to run off to the mall and buy a new TV is now MIA, at least for the moment. It’s debatable how soon consumer spending will rebound. Even more precarious is deciding how much it’ll rebound. Meantime, there’s no doubt that spending is out, saving and paying off debt is in. As we’ve discussed for some time, the recovery this time will be unusually slow and vulnerable to setbacks of one kind or another, including an end to government stimulus at some point. Having survived a near-death experience, the economy now faces an extended period of water torture.